High volume capacity with concrete permanence is why this receptacle is specified for a diverse array of installations. 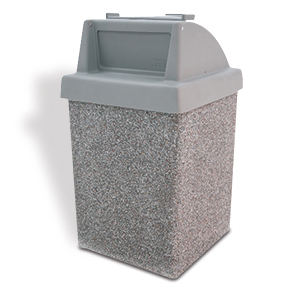 45 gallon capacity, sturdy weight and proves to be resistant to would be vandals-also a natural landscape fit. Perfect for food & entertainment environments, the tray-top caddy is a great solution where trays are a part of the experience. Self-closing push-door lid effectively shields contents, conceals odors and prevents access of unwanted insects or animals. Optional liner made from recycled plastic is sold separately. Ensuring maximum stability and durability these receptacles are made with rebar reinforced precast concrete, ASTM standards compliant and available in the standard and premium finishes as shown.